Popular blogger Jami Amerine is no stranger to chaos. On her blog “Sacred Ground, Sticky Floors”, she posts about Jesus, parenting, marriage, Lego-strewn floors, life hacks, and the general chaos of life. Her new book, which shares the title of her blog, is “a totally relatable account of her hilarious and honest experiences and misadventures in motherhood”. Come find the miracle in the mayhem. As moms, we know we've messed up in so many ways. Royally. Maybe you think you've failed your children, your spouse, and your God. But did you know that in the midst of your failures and fears, you are still loved—royally? As a child of noble birth? Do you believe your children are in better hands than your own and that you don't need to hold on so desperately? Jami Amerine, author of Stolen Jesus, delivers a totally relatable account of her hilarious and honest experiences and misadventures in motherhood. She's eager to help you see how to let your Heavenly Father parent you, so you can embrace peace as you parent your children. Hope For Women got to chat with Jami about Sacred Ground, Sticky Floors and where she’s found hope lately. Q: Just for fun: When was the last time you belly-laughed? HOPE: haha! ‘pencil finkin’ - love it! Q: Which life hack are you loving right now? Jami: The messy bun. I am the official messy bun world ambassador – self nominated. HOPE: I wonder what the perks are with that ambassadorship? 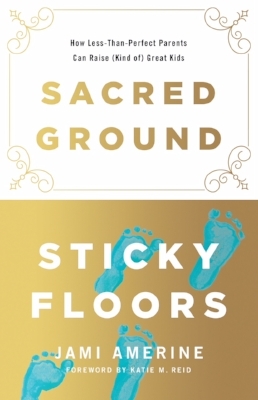 Q: What can readers expect from your new book, Sacred Ground, Sticky Floors? Jami: I would hope they would gain freedom. It is the story of my freedom from works-based parenting. The idea that God was disappointed with me when my kids were struggling. I believe that He loves me… and He loved us as daughters before we became mothers. We are always His girls. HOPE: “We are always His girls.” - what a heart-lifting concept! Q: I love that quote! How do you adopt that ‘divine perspective’ of sacred ground even among the sticky (and painfully Lego-strewn!) floors? Jami: He stays. No matter how insane my life is God is my friend. That was the entirety of the Cross. The veil was torn and NOTHING can separate me from Him. No burnt casserole, no laundry mishap, no accomplishment, or failure. This is my mantra. It is hard to get out of the habit of “earning it.” But once you are free… you are free indeed. Q: “Non-frantic parenting.” Does that even exist? How DO you parent from a place of peace? Jami: Well, I think when we come to the place of allowing God to parent us well, free from the belief that we can let Him down, it is just an easier place of living. I have a peace I didn’t used to have. There are still frantic moments, but He overcame the world. I finally believe Him… not just that He exists but that I actually believe I am who He says I am… daughter. HOPE: This is a truth even those of us who aren’t moms can take to heart. No matter how frantic life - and the world - seem, we are His daughters. Always. Q: Where have you found hope lately? Jami: Only recently I said to my husband, He hasn’t always answered the way I asked, but He always has answered. I have a lot of hope knowing that He is always with me. Hope is faith in motion. It is easier to hope for something than define it is as precise. I think that increases faith. HOPE: You know we love that definition - Hope is faith in motion. Thanks for chatting with us! Jami Amerine is an author and blogger at Sacred Ground Sticky Floors. She and her husband, Justin live in north Houston. They have 6 children ages 23 all the way to four years. They are advocates for foster care and adoption. More information can be found at sacredgroundstickyfloors.com.